C-3PO and the Ewoks' Golden One on Endor! Inspired by the Star Wars movieReturn of the Jedi. Unframed canvas print measures 30-inches wide x 11 1/4-inches tall. Hand-numbered limited edition of only 125 pieces, signed by artist Joel Payne! 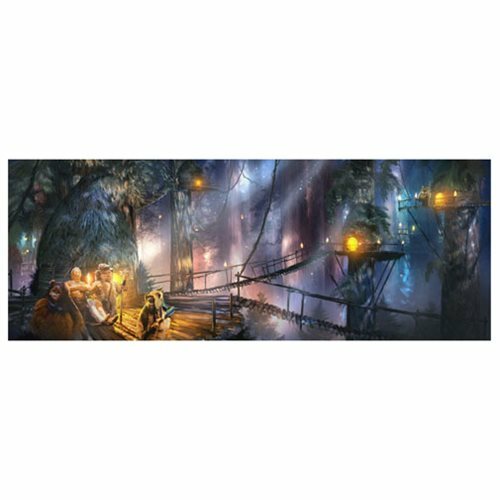 C-3PO and the Ewoks' Golden One on Endor star in this stunning Star Wars: Return of the Jedi The Golden God Canvas Giclee Art Print by artist Joel Payne. Inspired by the Star Wars movieReturn of the Jedi, The Golden God is a hand-numbered limited edition of only 125 pieces, each signed by the artist. Unframed, it measures 30-inches wide x 11 1/4-inches tall and comes with a certificate of authenticity.